"The temples of the City and Venus rise to the same high top and incense is burned to the pair of goddesses together." The largest and most splendid of Rome's temples, the Temple of Venus and Rome was designed by Hadrian, himself. Although consecrated in AD 121, construction did not begin until about AD 125. The temple was dedicated ten years later (Cassiodorus, Chronicle entry for AD 135), and may have been finished by Hadrian's successor Antoninus Pius sometime between AD 140 and 145, as shown on several sestertii issued during his reign. Damaged by fire in AD 307, it was restored "in magnificent manner" by Maxentius (Aurelius Victor, De Caesaribus, XL). Indeed, when Constantius visited Rome fifty years later, this Temple of the City (Templum Urbis) was one of the sights that he most admired (Ammianus, History, XVI.10.14). In AD 625, Pope Honorius received a special dispensation from Heraclius to strip the gilded bronze roof tiles for the repair of old basilica of St. Peter's. 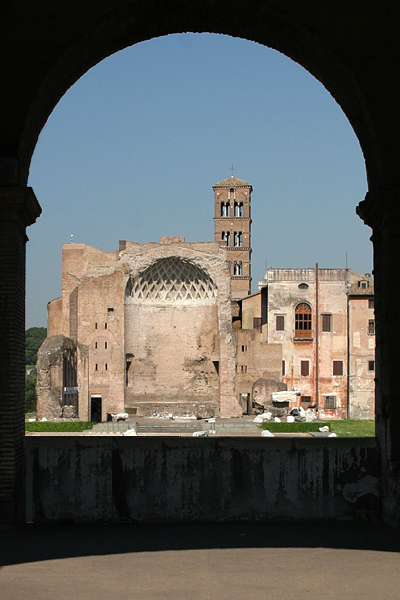 During a twelve-day visit to Rome in AD 663, Constans II then "pulled down everything that in ancient times had been made of metal for the ornament of the city, to such an extent that he even stripped off the roof of the church of the Blessed Mary which at one time was called the Pantheon, and had been founded in honor of all the gods" (Paul the Deacon, History of the Lombards, V.11). What remaining bronze and other ornaments that had decorated the city were all shipped to Constantinople. An earthquake in AD 847 further contributed to the despoliation of the temple, including a church amidst the ruins, which Pope Leo IV quickly rebuilt as Santa Maria Nova. The Temple of Venus and Rome had two adjoining cellae, or sacred inner chambers, each of which held a cult statue: Venus Felix, ancestor of the Roman people, and Roma Aeterna, the genius (personification) of the city—a symmetrical arrangement that may have been influenced by the palindrome that the two deities evoked, Roma and Amor. Situated on the slope of the Velia Hill, with the Arch of Titus at one corner and the Via Sacra passing down its flank, Hadrian's temple effectively joined the Forum (upon which Roma looked) and the Colosseum (which was faced by Venus). 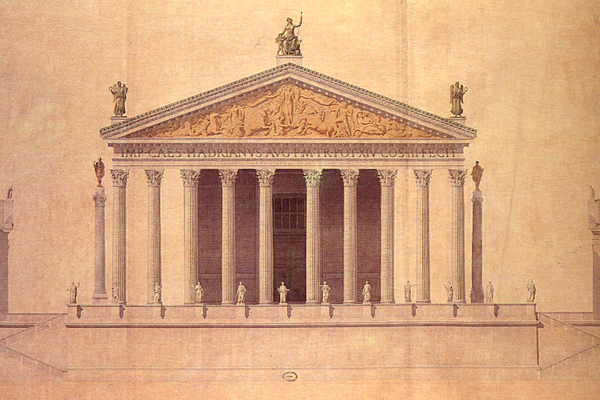 The temple was decastyle, the only one in Rome to have ten columns across its principal façade. Robinson further describes it as "dipteral at the ends, pseudo-dipteral along the sides, with a pronaos at each end tetrastyle in antis." Whereas a dipteral temple has two rows of columns along all four sides of the cella, a pseudo-dipteral temple omits this inner course of columns, leaving a wider passage around the cella. Here, the sense of four columns between the antae of the portico at both the front and rear of the temple give the impression that it is dipteral. That having been said, an aerial view of the temple clearly shows a double row of columns along the sides. In AD 131-132, Hadrian had dedicated the Temple of Olympian Zeus in Athens, when he visited the city for a second time. And, to be sure, there are similarities between the two. Both were surrounded by a paved court enclosed by a portico from which the stylobate could be approached by steps on all four sides. And both temples are peripteral, having columns on all four sides, and dipteral, with two rows of twenty columns on the long side. The Temple of Olympian Zeus, however, is octastyle, with eight columns across the principal façade, rather than ten. When the site was consecrated, the Colossus of Nero, which had overlooked the Roman Forum, was relocated between the temple and the Flavian Amphitheater, the colossal statue later giving the Colosseum its name. The author of the Historia Augusta relates that twenty-four elephants were required to transport the huge bronze figure, which was 120 feet high (Life of Hadrian, XIX.12; Suetonius, Life of Nero, XXXI.1; Pliny, Natural History, XXXIV.45). 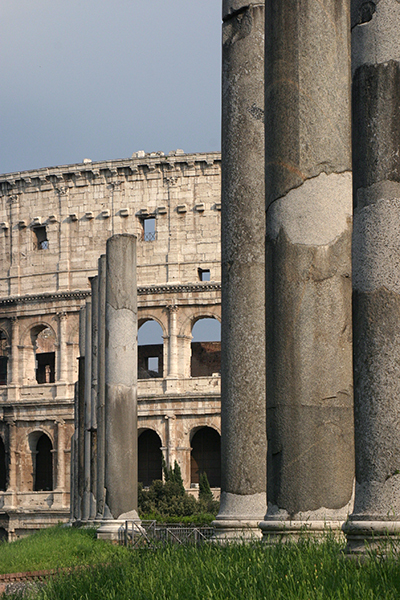 Hadrian asked Apollodorus, who had designed the Forum of Trajan, to comment on his design. He allegedly replied that the temple was too low and the statues of the gods too tall for the space they occupied. "'For now,'" he said, 'if the goddesses wish to get up and go out, they will be unable to do so'" (Dio, Roman History, LXIX.4.1-5). Hadrian was so exasperated at the presumption of the remark that he banished Apollodorus and later may have had him put to death (although the story may be apocryphal). These Corinthian columns of gray Egyptian granite on their white marble bases mark the perimeter of the massive platform that enclosed the temple precinct, which here faces the Colosseum. Access from this end was by two flights of steps at each corner of the platform. From the Forum, the approach was by a single broad flight of steps. "He was quite considerably learned in literature and was called by many 'Greekling.' He devoured the pursuits and customs of the Athenians, having mastered not merely rhetoric, but other disciplines, too, the science of singing, of playing the harp, and of medicine, a musician, geometrician, painter, and a sculptor from bronze or marble who approximated Polycletus and Euphranoras....He was diverse, manifold, and multiform; as if a born arbiter with respect to vices and virtues, by some artifice he controlled intellectual impulse. He adroitly concealed a mind envious, melancholy, hedonistic, and excessive with respect to his own ostentation; he simulated restraint, affability, clemency, and conversely disguised the ardor for fame with which he burned." Given the slope of the terrain, the temple platform facing the Colosseum is almost thirty feet higher than at the top of the hill, and one still can see the vaulted chambers exposed beneath it. Not only was the temple too low, Apollodorus further had suggested that "it ought to have been built on high ground and that the earth should have been excavated beneath it, so that it might have stood out more conspicuously on the Sacred Way from its higher position, and might also have accommodated the machines in its basement, so that they could be put together unobserved and brought into the theatre without anyone's being aware of them beforehand" (Dio, Roman History, LXIX.4.4). To be sure, machinery and apparatus for the Colosseum may have been stored there, but there is no other basis for the suggestion. This état restauré by Léon Vaudoyer (1830) illustrates the façade of the temple facing the Colosseum. The picture (top) was taken through an arch in the Colosseum and shows the rear wall of the rededicated Church of Santa Francesca Romana, which was built in 1612 on the site of the ninth-century church. It preserves the apse of the temple cella that held the statue of Venus. To the right is displayed a large section of the marble cornice. In AD 382, Gratian removed the altar and statue of Victory from the Senate House, which prompted a plea by the pagan aristocrat Symmachus that they be restored. Who was so friendly with barbarians, he asked, as not to require an Altar of Victory (Relation III). Twenty years later, the Christian poet Prudentius offered a refutation. Written so late, Contra Symmachus may have been prompted by the defeat of the Goths in AD 402 at the Battle of Pollentia, a victory celebrated in the poem (702ff) as offering proof that the Christian God could protect Rome, who declares "Let Christ alone rule and keep our palaces" (765). Symmachus himself died that year and Prudentius also may have felt confident enough to reply to "that very noble senator...who is such a master in the art of speech" (644). The burning of incense to Roma and Venus that is mentioned must have been among the very last acts of such veneration in Rome, as the temple itself presumably had been closed ten years earlier, when in AD 391 Theodosius promulgated a series of decrees prohibiting pagan worship. References: The Architecture of Roman Temples: The Republic to the Middle Ages (2005) by John W. Stamper; A New Topographical Dictionary of Ancient Rome (1992) by L. Richardson, Jr.; History of the Lombards by Paul the Deacon (1907) translated by William Dudley Foulke; Epitome De Caesaribus (2009) translated by Thomas M. Banchich (which differs from the Liber De Caesaribus translated by H. W. Bird); Prudentius: Contra Orationem Symmachi, Liber II (1953) translated by H. J. Thomson (Loeb Classical Library). See also Victoria, Apollodorus, and Temple of Olympian Zeus.